CLICK HERE to read a poem written for Paul by his Aunt Carol. CLICK HERE to read Kristin Fallon's tribute to Paul. CLICK HERE to read J.Browne's tribute to Paul. CLICK HERE to read Seth Mates' tribute to Paul. CLICK HERE to read the story about Paul from the Sept. 17 issue of the Press & Sun-Bulletin newspaper in Binghamton. CLICK HERE to read the story about Paul from the Sept. 24 issue of Pipe Dream (Binghamton University's student newspaper). 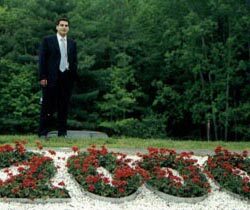 CLICK HERE to read the letter written by Brian Napolitano, Seth Mates and Jeremy Klaff in April 1999, nominating Paul for Student Leader of the Year at BU. CLICK HERE to see the listing for Paul on NBC.com's Missing Persons site. CLICK HERE to read B.J. Manning's eulogy. CLICK HERE to read a story about the Leinungs from the New York Times. CLICK HERE to read a story about Paul which appeared in a San Antonio newspaper last October.